I love the Muppets. Some of you may already know this about me. A little bit ridiculous, but it's kind of my thing. 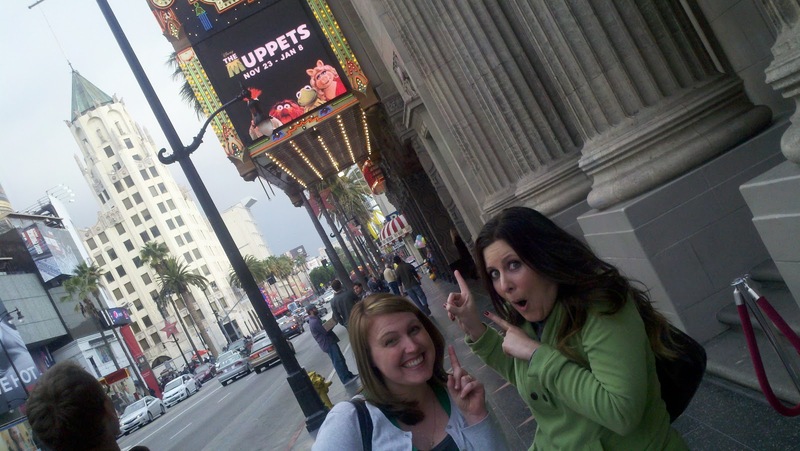 A few weeks ago, we planned a trek to Hollywood to watch the premiere of the new Muppet movie. The car was packed, LJ and JP came to pick me up from work. It was 2pm and pouring rain. Everyone was hungry and LJ was about to have a melt down because they had just come from a routine, last-minute oil change (that took 2.5 hours). Said inspection uncovered a dire need for two new tires. My in-laws decided at the last minute not to join us for the trip because their dog randomly got sick and was dying. After assessing the situation, we decided that all these little issues added up to one big flashing STOP sign and decided to scrap our trip. I was super bummed. I was even more bummed when my Hollywood dwelling brother-in-law got super close to the red carpet action and texted me a bunch of pics of what I was missing. Wah wah wah. 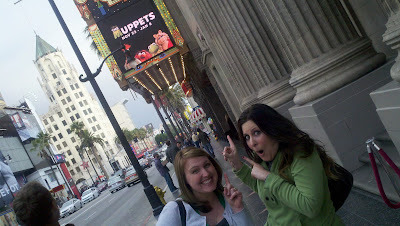 So, we met up with my Muppet-loving friend Heidi and got the full Muppet experience! We were really really excited about this. We saw an awesome exhibit of Miss Piggy's costumes from the film. Posed in front of lots of promotional props. 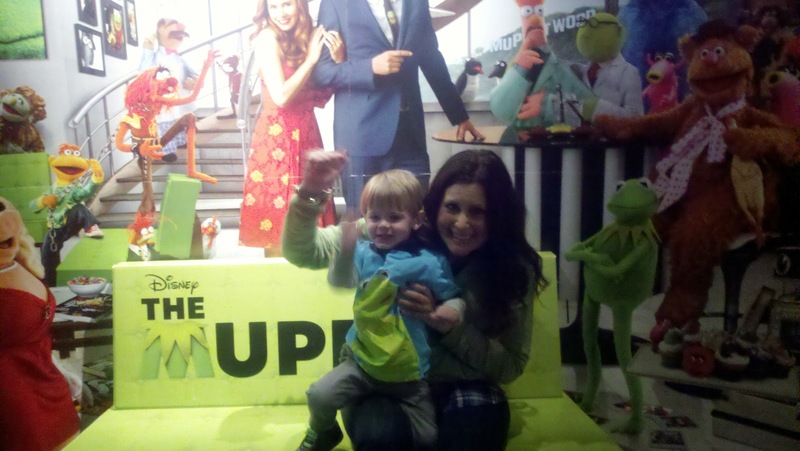 And got to sing Christmas carols before the show with Kermit and Miss Piggy! Can you say "highlight of my life?" And LJ got this sweet commemorative Muppet bucket that he enjoyed the whole weekend. We also found Kermit's star on the Hollywood Walk of Fame. JP's brother lives right off Hollywood Blvd in a studio apartment, so we always have a cramped, but fun time visiting him and getting an authentic Hollywood experience. The rule for staying at Jeff's place is: "You stay at my place, you buy me a crepe," so we went to our favorite crepe place at Hollywood and Highland. LJ has been obsessed with guitars lately, so we knew being in a tiny apartment surrounded by several of his musician Uncle's "ge-gahs" was going to be interesting. Sure beats pretending with a frying pan or a shampoo bottle! We also went to the Newport Beach lighted boat parade on Saturday night. One problem. We got there at 6:30pm and didn't see any legitimately "lighted boats" until 8:30pm. This made us sad. So, we had two hours on the chilly beach in the dark looking at this and playing in the sand with a few dozen other parade goers. We all got a little punchy. Then the boats came! Hooray! There were some pretty impressive yachts with amazing displays. I'm not sure if Heidi agrees, but we had a great time and it was totally worth the wait! All in all, a great weekend full of tons of pre-Christmas fun! I DO agree! It was a great weekend and a great time at the boat parade. I love hanging out with you guys...and the "reenactment" that Justin provided us with was.well. HYSTERICAL!!!!! Where Does This Farm Life Come From?